"Stationed across Indochina during the 1940s and 50s, French troops grew tired of the tropical climate and yearned for the alpine scenery and colder weather that many of them had left behind in Europe. Incredibly, in the Vietnamese city of Saigon, L'institut indochinois pour les sports d'hiver was founded, and plans were drawn up to build and operate indoor ski slopes in Saigon and Phnom Penh for use by soldiers, expats and interested locals. " Rhys Griffiths is the man behind Ski Saigon, a project that combines music and storytelling. The London-based artist just released his first EP Brings the Storm Clouds that is accompanied by a 32-page book of fictional history. 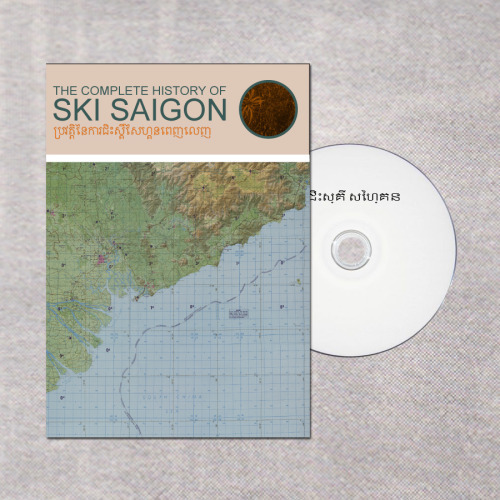 Recorded at Holy Mountain Studio in London, this concept album tells the story of an indoor ski hill built in Saigon just before the Vietnam War. Like the make-believe story it tells, the music is an escapist's paradise. Rare Candy: There’s not very much information online about this Ski Saigon project and I was hoping you could tell me about your idea for this project and its background. Rhys: I’d written these songs, but I didn’t want it to be a boring, standard record. I was joking with my friends about Ski Dubai - that ski slope in Dubai. It seems so crazy to have this indoor place where it’s always winter when you’re in a desert. I was traveling in Vietnam and Cambodia at the time and I wanted to make something up that was vaguely about that kind of history. And then I just thought, why not make up a fake history, why not write about the fake story of this first ski slope that was opened in Vietnam. Because it could have happened - stranger things have happened in history. I really enjoyed writing the book, probably more than I did making the record. RC: Did the EP come first or did the book? Rhys: I wrote the music first then had the idea for the story. I’m just another guy who’s making music, who’s interested in my personality? I’m not hiding behind anything, but I wanted to make this project more interesting to people. RC: In what ways has your environment shaped this process? Rhys: I recorded the EP in London which is a long way from Vietnam, a long way from all the things I talked about, so I would say escapism was a big part of it. London’s really grey and it rains a lot, so the idea of creating this project that was set in the tropics, where there’s jungle and a lot of different history was attractive. I work for a history magazine so I read a lot of history. RC: Well the music definitely carves out its own headspace. Rhys: Yeah, I hope so, that’s really lovely to hear. I wanted the first sound on the record to express a golden age right before terrible things happen, so the first sound you hear is from a Cambodian movie from the 60’s. Then, Cambodia had a king who was called Norodom Sihanouk. He was interested in the arts and loved cinema and paved the way for all this music and kind of really promoted the arts in Cambodia. This was before the communist take over, and genocide. RC: Do have anything else that you’d like people to know about this album? I’d love to hear more about the individual songs also. Rhys: The last song on the record is taken from the title of a song by a Cambodian singer named Sinn Sisamuth who was somewhat like the Elvis of Cambodia. Even today I think he’s a household name, but he was killed in the genocide and no one knows what happened to him, as many artistic people were in that time. That song is about how worlds collapse, how things can just disappear, and you can become irrelevant, or forgotten overnight. RC: It’s like the architect that you write about in the book and how he disappears by swimming out into the sea. Rhys: Right, it’s really cool that you actually read it [the book]. RC: Holy Mountain Studio, where you recorded, has said that they like to keep their music organic and natural sounding, how was working with them? Rhys: Yeah, he’s a guy called Misha, it’s in Hackney in London. It’s a very creative record label, they do lot’s of innovative releases. I think they released a single cut where they released singles in pizza boxes and cigarette packets and stuff like that. I was quite lucky that they were open to the idea of publishing a fake history, it’s been really great. RC: Do you have any bands or specific music you’re really into right now? Rhys: At the moment, I really like Les Halles, it’s ambient soundscapes, he’s from Lyons in France. I also really like the new Jenny Hval record, she’s a Norwegian artist. Also, there are a lot of archival record labels right now. Especially in the States, there are so many - Light in the Attic, Mexican Summer has a spin off label called Anthology Recordings- that same kind of thing, finding great, lost records from the 70’s and reissuing them. RC: The final question I have for you- do you have any new projects coming out or in the works currently? Rhys: We’re recording a new album which I think is going to be another kind of concept album, but this time about the Portuguese age of discovery in the 1500s, with Vasco de Gama, basically when Portugal discovered India and Africa. A similar kind of thing I guess. RC: Will this project still be under the name Ski Saigon? Rhys: Yeah, it’s hard enough to make a presence for yourself, so I don’t intend to reinvent myself every time. I’m not someone who’s famous enough to rely on people being interested. Listen to more Ski Saigon on Bandcamp.